Actor Sawamura Tanosuke II as Yaoya Oshichi, climbing a ladder to beat a fire alarm drum and Bando Jiro as Nita/Nitta Jiro. The play was based on an actual incident in 1681 when the real Oshichi, daughter of a greengrocer, fell in love with a young priest whom she met at his temple while seeking shelter from a large fire. Hoping to see him again, she set fire to her own home, causing a massive blaze that led to her execution for arson. 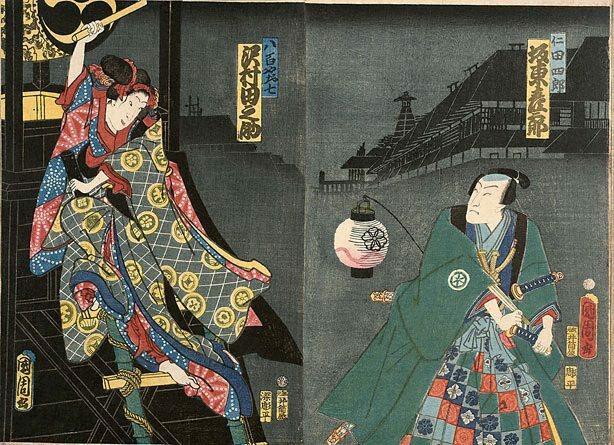 Yaoya Oshichi became a legend and a leading character in several Kabuki plays. In the play she raises a fire alarm by beating a drum, knowing that the penalty for raising a false alarm is death by immolation. (right sheet) signed "Kunichika ga", Izutsuya publisher's seal, block carver's seal unidentified (Chohei); (right sheet) signed "Kunichika ga", Izutsuya publisher's seal, block carver's seal unidentified (Chohei). Actor Sawamura Tanosuke II as Yaoya Oshichi, climbing a ladder to beat a fire alarm drum and Bando Jiro as Nita/Nitta Jiro.